Alumnae membership education is encouraged for every alumna in any stage of life. The format of alumnae membership education is a quarterly newsletter that will be distributed through email. Each newsletter will contain links to articles and videos corresponding to Alpha Sigma Alpha’s core values and aims. Each quarterly newsletter will also invite alumnae to participate in a challenge centered on one of Alpha Sigma Alpha’s aims. 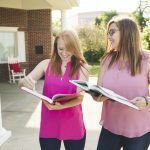 The optional challenges will be a call to action for alumnae to live out the mission of Alpha Sigma Alpha of emphasizing balance among our four aims of intellectual, physical, social and spiritual development in their everyday lives.